Spacio Pro, an open house sign-in iPad app, can now display agent testimonials collected by RealSatisfied. Spacio, the app's provider, says the feature can give buyers 'piece of mind' when they engage listing agents hosting open houses. Spacio Pro can gather information on open house attendees, send them marketing emails and integrate with some CRMs. Prospective buyers who venture into open houses sometimes have their guard up, wary of engaging strangers who are tasked with selling them something hugely expensive. An open house iPad app has unveiled a new feature designed to help listing agents build trust with these buyers and jack up the odds of converting them into clients. 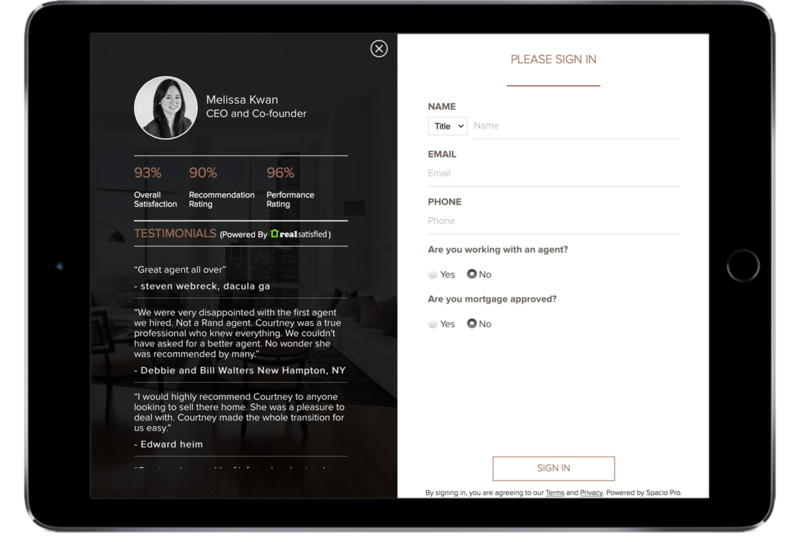 Spacio Pro, an iPad app that offers a digital open house sign-up sheet and lead-capture capability, can now feature agent testimonials collected by RealSatisfied, a platform that administers surveys and rounds up reviews on behalf of agents. Serving up the kind words of a listing agent’s past clients can bring prospective buyers “more peace of mind” when engaging the agent, said Melissa Kwan, CEO of Spacio, the maker of Spacio Pro. Screen shot showing how RealSatisfied testimonials can appear on Spacio Pro. Buyers can enter their names, email addresses and phone numbers into an iPad running Spacio Pro. The app can also prompt buyers to answer questions — such as whether a buyer is working with another agent or whether a buyer is prequalified — and automatically send listing details to them via email. These emails can now include agents’ RealSatisfied testimonials as well. A large part of Spacio Pro’s goal is to help agents do a better job of collecting prospective buyers’ information than they could using a paper sign-in sheet, so they can boost the return on investment of hosting open houses. “Right now, I see it as a lead capture tool, but I think the biggest opportunity is lead qualification,” Kwan said, alluding to the potential for agents to use the app to gauge the promise of leads. Spacio offers a basic version of Spacio Pro for free, but agents who want to take advantage of premium features, such as integration with some customer relationship management systems (including Top Producer), must pay $15 a month. RealSatisfied is an agent review platform that automatically sends customer satisfaction surveys to homebuyers and sellers after a deal closes and then forwards that information to brokerages. When surveys suggest that a client was satisfied with an agent’s service, RealSatisfied asks the client to write a recommendation on the agent’s behalf. Agents and brokerages can tap a feed provided by RealSatisfied to surface testimonials on their websites. Century21.com uses a version of that feed to augment its agent profiles with RealSatisfied recommendations. Agents can share their testimonials on a RealSatisfied profile, realtor.com, Facebook and Twitter. Zillow Group, which recently merged Trulia and Zillow agent profiles, also offers the opportunity for agents, brokers and MLSs to display reviews on their website by tapping an agent profile API (application programming interface). Spacio Pro plans to eventually leverage Zillow’s API to also serve up Zillow reviews. Editor’s note: This story has been updated to correct that the open house iPad app is called Spacio Pro, not Spacio. Spacio is the provider of Spacio Pro.